Dark smoke and fire can be seen as organic peroxides burn at the Arkema plant in Crosby. 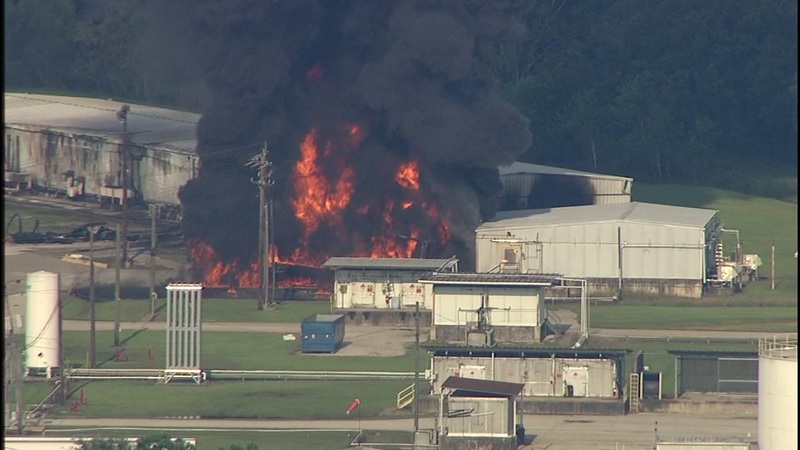 CROSBY, Texas (KTRK) -- Seven first responders who were called to the Arkema plant filed a lawsuit against Arkema, claiming they got sick after being exposed to fumes near the plant. No one from the plant told first responders about the chemicals or their risks, the lawsuit alleges. Arkema gave notice of a lifted evacuation order early Monday morning after consulting with officials monitoring the scene. For now, though, residents are also advised to use protective clothing and drink bottled water until further notice. Law enforcement and medical personnel were vomiting in the street and unable to breathe after arriving at the plant, according to the claims. At least 18 people were taken to hospitals after the initial fire and explosion at the plant Aug. 31. Arkema officials did not directly notify local emergency managers of the generator failure, officials said. It came, instead, by way of the plant's workers, who told the Crosby Volunteer Fire Department about it when they were rescued during the storm, she said. The lawsuit claims the company failed to properly store chemicals, provide proper backup plans and failed to alert first responders to the dangers of the fumes. The plant sits in a floodplain and had flooded before in 2006, leading to a similar incident, state records show. RELATED: Why wasn't more done to prevent flooding from taking out critical systems at plant that sits in floodplain? Arkema representatives contend the site was prepared with a backup generator, but that failed as several feet of water rose over the plant. Questions about how high generators had been installed went unanswered. In the company's risk management filing with the federal government, it presented a "worst-case scenario" disaster at the plant, but planned for that "worst-case" with the caveat that meteorological conditions would be "most favorable." In that report, flooding and hurricanes are identified as potential risks, but there are no details about how the plant prepares for such an event. Company representatives say they didn't expect "feet" of water over the plant. A safety official admits that the measures they had in place didn't go far enough. "We reject any suggestion that we failed to warn of the danger of breathing the smoke from the fires at our site, or that we ever misled anyone," a company representative said Thursday. "To the contrary, we pleaded with the public, for their own safety, to respect the 1.5 mile evacuation zone imposed by the unified command well prior to any fire. We will vigorously defend a lawsuit that we believe is gravely mistaken."